It's been 5 weeks since we found out that Peyton had cancer and brought her in for surgery. We're so lucky that we acted quickly and were able to schedule the surgery before the cancer was able to spread. Peyton is going to be fine. Her stitches are finally out and she's cone-free! Peyton's surgery was on her mouth so she had to be switched to a soft food diet for a few weeks. The morning of the surgery, I got an email from the team at Chewy.com asking if I wanted to try some of their items for Peyton. 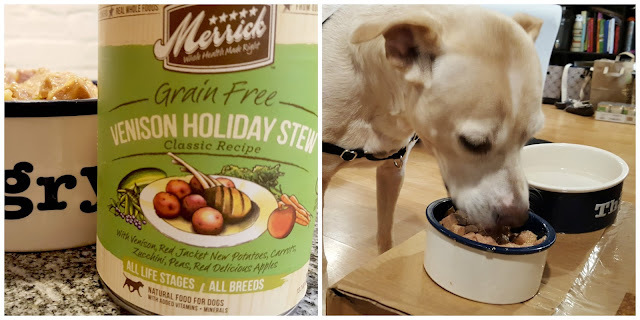 I checked out the list and came across Merrick Classic Grain-Free Venison Holiday Stew Recipe Canned Dog Food. 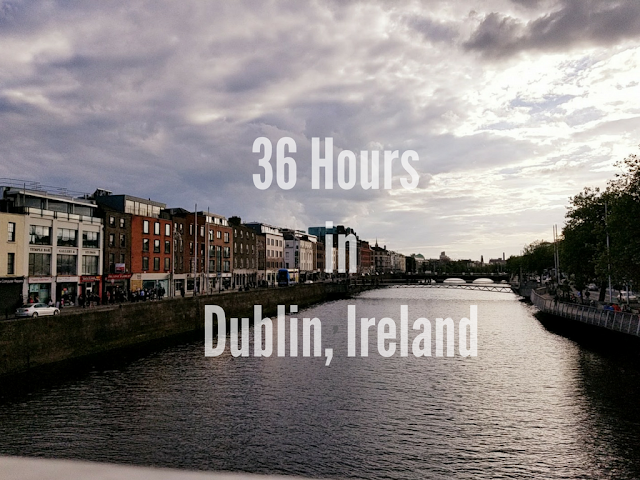 With Peyton switching to a soft food diet, I wanted to be able to try out a few options before investing in a case of food that she wouldn't eat. We had picked up a few cans of food when we brought her home from the vet and they all look like disgusting mush. I didn't want to handle this food, never mind feed it to her! When the box from Chewy arrived, Peyton was immediately intrigued. It was time to feed her so I opened a can right away. I was shocked to see that the food actually looked like real food! It actually looked like something I would eat! (You know, except for the fact that I don't eat meat and I'm not a dog. With giant chunks of venison and potatoes, peas, zucchini and carrots, Peyton gobbled up her first bowl in about 90 seconds. The fact it's grain-free is an added bonus since we learned that foods containing grains cause Peyton to break hives. 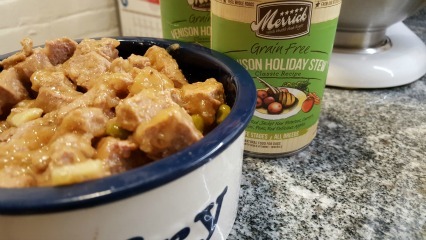 Peyton was on a soft food diet for about three weeks and this Venison Holiday Stew Recipe definitely made things a little bit easier since she was able to eat food that she actually enjoyed! 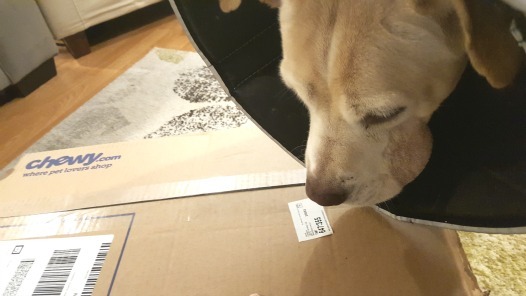 It helped that we gave her breaks from the cone while she was eating, so meal time quickly became her favorite time of the day! Now, I'm just happy that she's back to her normal self...dry food and all, but I think I may keep a case of this Venison Holiday Stew handy for occasional treats!